Variations in the anatomy of the root canal play an important role in the success of endodontic therapy, mainly in teeth with pulp necrosis. The morphology of the root canal system is complex and variable, especially in multi-rooted teeth . Usually maxillary molar teeth are described as having three roots: Mesiobuccal (MB), Distobuccal (DB), and Palate (P); however, there have been variations in their root and canalicular anatomy, ranging from 1-5 and up to 7 different canals in a single root . The permanent maxillary first molar is the tooth with the greatest complexity and variation [2,3], reflected in the higher rate of clinical failure , making it a constant challenge. One of the main causes of failure in the endodontic treatment of maxillary molars is the inability to locate the secondary Mesiobuccal canal (MB2), preventing proper debridement or obturation [5,6], which leads to poor long-term prognosis. Several studies have shown that the MB2 canal is present in more than 50% of first maxillary molars: Lee et al. (71.8%) , Rathi et al. (63.93%) , Abuabuara et al. (54%)  and Zheng et al. (50.40%) ; therefore, all possible methods must be used to locate and identify the canals of the root system. Different methods have been adopted to study the canalicular anatomy and location of the root canals, reporting differences in the results of their existence. An average detection rate of MB2 canals in in vivo studies of 40% has been considered compared with 80% described in in vitro studies . Staining techniques , root cross-sections , X-ray examination [9,12], magnifying glass , clinical surgical microscope , ultrasound , scanning electron microscope , CBCT [1,7,8,14] and microcomputed tomography  have been used. The incorporation of Cone Beam Computed Tomography (CBCT) has enabled clinicians to visualize inaccessible anatomical structures, making it a valuable aid for providing additional information for diagnosis and treatment . CBCT uses extraoral scanning to produce 3D orthogonal images of the maxillofacial skeleton and its structures, with a lower dose of radiation than conventional CT, has proven more accurate than digital x-rays in determining root canal systems. The significant increase in reports on the location of the MB2 canal in recent years can be attributed mainly to a better understanding of their location and prevalence due to advances in technology, in particular ultrasonic tips and magnification. However, the MB2 canal often goes undetected by the clinician in daily practice . Clinically, the most common methods to evaluate the anatomy of root canals are the surgical microscope and conventional X-ray; however, access to microscope equipment, and the definition and detail that conventional X-ray provides limit detection of this canal. The aim of this study was to describe the prevalence and location of the MB2 canal in mesiobuccal roots of maxillary first molars using CBCT image analysis. The investigation was approved by the science ethics committee of the Universidad de La Frontera, Temuco, Chile (protocol nº 048/13). A cross-sectional observational descriptive study was designed. Sixty-three maxillary first molar images obtained through CBCT from the Department of Radiology, Faculty of Dentistry, Universidad de La Frontera (Temuco, Chile), in patients of both genders between November 2011 and August 2012 were examined. Imaging was taken as part of the diagnosis and treatment planning, using Pax Zenith CBCT equipment (Vatech, Korea, 2011), using 90 kV and 120 mA; 8 × 6 cm FOV and 0.12 mm voxel size. Images were selected that met the following inclusion criteria: subjects aged between 10 and 75 y, with the presence of the maxillary first molar with complete root formation. The molar root canals with endodontic filling or posts, rehabilitated using fixed prosthesis, calcified canals, evidence of periapical radectomy or surgery were excluded. Three patients were excluded, two due to endodontic treatment and one due to dental implant. The CBCT of 60 permanent first molar teeth (30 right and 30 left) were processed with the Ez 3D 2009 software, projected onto a LG 42LE4300-SA LED display. An apical crown scan was performed to identify the MB2 canal; to do this; the transverse plane was corrected, guiding the mesiodistal axis direction and the axial plane along the long axis of each tooth. The CBCT sections were calibrated with a range of 0.5 mm and 1 mm thickness. In teeth where the MB2 canal was present, the following protocol was performed: the furcation was located on the axial plane, and progress to the apex was made in 1 mm sections (two sections of 0.5 mm), where all root canals were observed. On this image, achieved in all teeth, the MB1 and palatal canals were located geometrically. The center point of each root canal was located: MB1 (center mesiobuccal canal), MB2 (center of second mesiobuccal canal) and P (center palatal canal). Then straight lines were projected, connecting different points: the MB1-P line and the MB1-MB2 line. A third line, MB2-T, corresponding to a perpendicular line between the MB2 and MB1-P (T point) line was drawn according to the parameters described by Gorduysus et al. and Tuncer et al. (Figure 1). Finally, the distance between the lines was measured in millimeters. Figure 1: Morphometric measurements applied to characterize the location of the MB2 canal in the mesiobuccal root of left maxillary first molar (axial view). Location of the central points of the MB1 (Mesiovestibular canal), MB2 (secondary Mesiovestibular canal) and P (Palatal canal). The red lines represent the join between the established points. The T point is the intersection of the perpendicular line drawn between point MB2 and line MB1-P. The distance between the lines was measured in millimeters. All images were analysed by two examiners after training and consensus was reached. The data obtained in relation to gender, age, side and distances between different points (line length) were entered into an Excel crosstab. The results were analysed using the SPSS software through descriptive statistics and a chi-squared test, establishing the relationship between the presence of MB2 canal by gender and jaw position (right or left). To establish the relationship with age, an ANOVA was used. Finally, to calculate the average distances between the MB2, MB1, P and T points, confidence intervals were calculated with a reliability of 95%. The MB2 canal was identified in 68.3% of cases (41/60). In all cases, presence or absence, there were no differences in the observation. Of the maxillary first molars analysed by gender (29 in females and 31 in males), the MB2 canal was identified in the molars of women in 23 cases (56.1% of total identified) and in 18 cases in men (43.9%). According to the chi-squared test, there were no significant differences between gender and the absence or presence of the MB2 canal (p=0.313) (Table 1). Table 1: Number and frequency of the MB2 canal in the mesiobuccal roots of the maxillary first molars by gender. Depending on the position, the MB2 canal was present in 21 cases on the right side with a total frequency of 51.2%, and in 20 cases on the left side with a frequency of 48.8%. According to the chi-squared test, there were no significant differences between the absence or presence of the MB2 and position (p=0.781) (Table 2). Table 2: Number and frequency of the MB2 canal in the mesiobuccal roots of the maxillary first molars by tooth position. Regarding age, in cases where the MB2 canal was present (n=41), the mean was 24.9 ± 10.5 y, and in the absence (n=19) 28.1 ± 11.04 y. There were no significant differences between the presence and/or absence of MB2 by age (p=0.280) (Table 3). MB2: Secondary Mesiobuccal Canal; SD: Standard Deviation. Table 3: Average age associated with the presence of the MB2 canal in the population-specific sample of Temuco, Chile. According to the average distances between the points discussed, among MB2-P the average distance was 6.91 ± 1.47 mm with an average range between 6.4570 and 7.3663 mm. For points MB2-MB1 the average distance was 2.61±0.64 mm, with a range between 2.4168 and 2.8157 mm, and for MB2-T the average distance was 1.26 ± 0.36 mm, with a range between 1.1479 and 1.3731 mm (Table 4). Figure 2 illustrates the variability of the analysed distance dispersion. Table 4: Distance between the reference points chosen for the geometric location of the MB2 canal in the maxillary first molar. Figure 2: Axial view of the left maxillary first molar. Dispersion of location between points MB1 and MB2 (red dots), MB-P (green dots) and MB2-T (blue dots) in the entire analysed sample. The location of the MB2 canal in the maxillary first molar is complex due to its variable position and narrow foramen. The presence of the MB2 canal was observed in vivo using CBCT in 68.3% of cases, similar to those reported by Abarca et al. (73.44%) , Lee et al. (71.8%) , Betancourt et al. (68.75%)  and Rathi et al. (63.93%) . Although frequencies below 54% , 50.40%  and 37.05%  have also been identified using CBCT. On the other hand, computed microtomography frequencies of 80%  and 90%  have been reported in extracted teeth, probably due to factors such as a high sensitivity exam, sample size or the population studied. The use of CBCT to explore the anatomy of root canals has been compared to histological studies with a high correlation (Figure 3) . The in vitro methods used to study the MB2 show a frequency similar to this study; Alavi et al. reported 65% by clarification; Baratto et al. and Alacam et al. , 67.14% by microscopy and 67% respectively, and by combining microscopy and ultrasound achieved a detection of 74%. By using these methods in vivo, frequencies of 53.26% and 62% are achieved while using periapical radiographs, where they were observed in only 8% , demonstrating the effectiveness of CBCT. 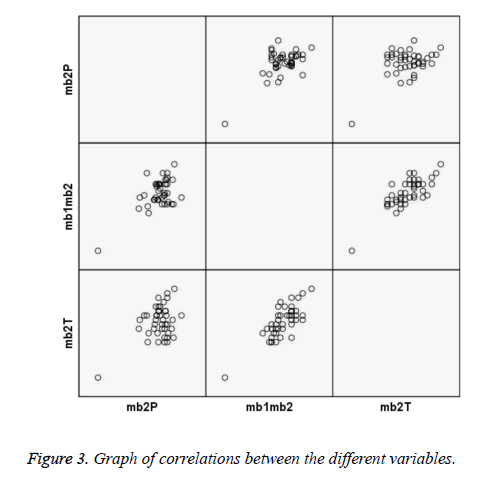 Figure 3: Graph of correlations between the different variables. The findings of our specific population are close to those observed in Korea (71.8%) , Thailand (68.5%) , the UK 65%  and India (63.93%)  and are superior to those observed in Brazil (54%)  and China (52%) , whereas it is low compared to the populations of Italy (80%)  and Turkey (78.18%) . The frequency of the MB2 canal was greater in 24.9 ± 10.5 y of age, similar to what was reported by Betancourt et al. (25.31 ± 11.65 y) . The limited literature exploring the use of CBCT is variable, observed between 20-30 years , 30-49 y , and 51-60 y . This may be due to the sample size used and studies on the age concentration of the study subjects, although all the studies showed ranges from 14 ± 4 to 75 ± 3 y. There are no studies that categorize age ranges to establish a basis for comparison. No differences were found for gender or location in the maxilla, similar to that reported by Zheng et al. . Other research has shown some non-significant trends , which may be related to a population-specific factor. The MB2 canal was located 2.61 mm palatally to the MB1 canal, the highest reported in the literature, and comparable with the results of Gilles and Reader , that placed the MB2 canal with respect to the MB1 canal at a distance of 2.31 mm by scanning electron microscopy and Zhang et al. at 2 mm using light microscopy. Shorter distances have been reported by Kulid and Peters  with 1.82 mm. Gorduysus et al. , who located the MB2 canal in 45 extracted maxillary molars with a distance between MB1-MB2 of 1.81 ± 0.38 mm, and Vasudev and Goel  with 1.8 mm. Tuncer et al. located the MB2 canal in 65 molars at 1.73 mm palatally to the MB1 canal, and 21 molars at a distance of 1.86 mm palatally. Even smaller distances have been reported by Peeters et al. (1.55 mm) , and Degerness et al. (1.3 mm) . This could be explained by the higher sensitivity of the in vitro studies or the use of microscopes, having a magnification of 6.4X, which distorts image scales. The location of the MB2 is also variable with respect to the palatal canal [4,12]. In our observations, it was located mesially to the MB1 and palatine canals, consistent with that described by Vasudev and Goel . The total distance between MB1-P was 6.91 mm and MB2-T was 1.26 mm. Gorduysus et al. located the mesial MB2 canal at a distance of 0.69 ± 0.42 mm (MB2-T), while Zhang et al. less than 1 mm mesially to the MB-P line, and Tuncer et al. 0.87 mm distally to the MB1 canal (65 molars) and 0.72 mm mesially (21 molars). We believe that the variation in the location distally or mesially, depends on the type of study, as in vitro experiences show the anatomical relationship but the proportion in the arc is lost; by contrast, in vivo studies, particularly with CBCT, can view the axes and planes with a better orientation. These observations suggest modifying the design in the cavity chamber access due to the MB2 canal position, an initial access more rhomboid or quadrilateral in shape would be better than the classic triangular access [17,24] and would allow a shortcut in the presence of the MB2 canal, or increase the probability of finding it. CBCT provides better results than other methods such as intraoral radiography, microscopy and visual observation. It is an effective and non-destructive tool to study the presence and location of the MB2 canal in vivo, preoperative planning of its access, unlike ultrasound microscopy, where locating the MB2 is random after gaining access. Preoperatively, intraoral X-rays, even when different angles are taken, can only study the morphology of the two-dimensional canals with distortion and overlapping structures. By contrast, CBCT allows three-dimensional reconstructions and multiplanar measurements canalicular morphology, with a low dose of radiation being limited to the anatomical area investigated, with a high resolution spiral CT. This is used increasingly for resolving endodontic problems . However, drawbacks like dispersion due to high density structures such as enamel, metal posts or restoration imaging affect quality and diagnostic accuracy. In addition, the patient must lie still during the exposure time, and it is still expensive in terms of a cost-benefit ratio, however, this is insignificant. In conclusion, the clinician must be satisfied that the MB2 canal is present in a high percentage of maxillary first molars. When present, it is advisable to take the main mesiobuccal canal as a parameter and explore some millimeters mesially and palatally to display it. The average distance between MB1 and P was 6.91 ± 1.47 mm, between MB1 and MB2 2.61 ± 0.64 mm and MB2-T 1.26 ± 0.36 mm. The inability to locate and treat it can lead to bacterial colonization, infection and endodontic failure; even partial treatment will increase the likelihood of success . The location of the MB2 canal is essential, and the use of clinical tools like the microscope or ultrasound with a diamond or square access and performing further examination by CBCT may be important factors for successful endodontic treatment or re-treatment. This study was supported by DIUFRO project #DI14-0034, Universidad de La Frontera, Temuco, Chile. Radiology Unit for providing CBCT exams and the Master of Dentistry Program at the Universidad de La Frontera, Temuco, Chile. Abarca J, Gomez B, Zaror C, Monardes H, Bustos L, Cantin, M. Assessment of mesial root morphology and frequency of mb2 canals in maxillary molars using cone beam computed tomography. Int J Morphol 2015; 33: 1333. Kottoor J, Albuquerque D, Velmurugan NA. New anatomically based nomenclature for the roots and root canals-Part 1: maxillary molars. Int J Dent 2012; 2012: 120565. Zheng Q, Wang Y, Zhou X, Wang Q, Zheng G, Huang D. A cone-beam computed tomography study of maxillary first permanent molar root and canal morphology in a Chinese population. J Endod 2010; 36: 1480-1484. Zhang R, Yang H, Yu X, Wang H, Hu T, Dummer PMH. Use of CBCT to identify the morphology of maxillary permanent molar teeth in a Chinese subpopulation. Int Endod J 2011; 44: 162-169. Alacam T, Cemal AC, Genc O, Kayaoglu G. Second mesiobuccal canal detection in maxillary first molars using microscopy and ultrasonics. Aust Endod J 2008; 34: 106-109. Peeters H, Suardita K, Setijanto D. Prevalence of a second canal in the mesiobuccal root of permanent maxillary first molars from an Indonesian population. J Oral Sci 2011; 53: 489-494. Lee J, Kim K, Lee J, Park W, Jeong J, Lee Y, Gu Y, Chang S, Son W, Lee W, Baek S, Bae K, Kum K. Mesiobuccal root canal anatomy of Korean maxillary first and second molars by cone-beam computed tomography. Oral Surg Oral Med Oral Pathol Oral Radiol Endod 2011; 111: 785-791. Rathi S, Patil J, Jaju PP. Clinical study detection of mesiobuccal canal in maxillary molars and dis-tolingual canal in mandibular molars by dental CT: A retrospective study of 100 Cases. Int J Dent 2010; 2010: 291276. Abuabara A, Baratto-Filho F, Aguiar Anele J, Leonardi DP, Sousa-Neto MD. Efficacy of clinical and radiological methods to identify second mesiobuccal canals in maxillary first molars. Acta Odontol Scand 2013; 71: 205-209. Alavi A, Opasanon A, Ng YL, Gulavibala K. Root and canal morphology of thai maxillary molars. Int Endod J 2002; 35: 478-485. Schwarze T, Baethge C, Stecher T, Geurtsen W. Identification of second canals in the mesiobuccal root of maxillary first and second molars using magnifying loupes or an operating microscope. Aust Endod J 2002; 28: 57-60. Gorduysus OM, Gorduysus M, Friedman S. Operating microscope improves negotiation of second mesiobuccal canals in maxillary molars. J Endod 2001; 27: 683-686. Das S, Warhadpande MM, Redij SA, Jibhkate NG, Sabir H. Frequency of second mesiobuccal canal in permanent maxillary first molars using the operating microscope and selective dentin removal: A clinical study. Contemp Clin Dent 2015; 6: 74-78. Betancourt P, Fuentes R, Aracena Rojas S, Cantin M, Navarro Caceres P. Prevalence of a second canal in the mesiobuccal root of maxillary first molars by cone-beam computed tomography. Av Odontoestomatol 2013; 29: 31-36. Somma F, Leoni D, Plotino D, Grande NM, Plasschaert A. Root canal morphology of the mesiobuccal root of maxillary first molars: a micro-computed tomographic analysis. Int Endod J 2009; 42: 165-174. Patel S, Dawood A, Whaites E, Pitt Ford T. New dimensions in endodontic imaging: Part 1. Conventional and alterna- tive radiographic systems. Int Endod J 2009; 42: 447-462. Tuncer AK, Haznedaroglu F, Sert S. The location and accessibility of the second mesiobuccal canal in maxillary first molar. Eur J Dent 2010; 4: 12-16. Baratto F, Zaitter S, Aihara G, Alves E, Abuabara A, Maria G. Analysis of the internal anatomy of maxillary first molars by using different methods. J Endod 2009; 35: 337-342. Verma P, Love RM. A Micro CT study of the mesio- buccal root canal morphology of the maxillary first molar tooth. Int Endod J 2011; 44: 210-217. Michetti J, Maret D, Mallet JP, Diemer F. Validation of cone beam computed tomography as a tool to explore root canal anatomy. J Endod 2010; 36: 1187-1190. Sert S, Bayirli GS. Evaluation of the root canal configurations of the mandibular and maxillary permanent teeth by gender in the Turkish population. J Endod 2004; 30: 391-398. Gilles J, Reader A. An SEM investigation of the mesiolingual canal in human maxillary first and second molars. Oral Surg Oral Med Oral Pathol 1990; 70: 638-643. Kulild J, Peters D. Incidence and configuration of canal systems in the mesiobuccal root of maxillary first and second molars. J Endod 1990; 16: 311-317. Vasudev SK, Goel BR. Endodontic miscellany: Negotiation and Management of canal in max- illary molar. Endodon 2003; 15: 33-36. Degerness R, Bowles W. Anatomic determination of the mesiobuccal root resection level in maxillary molars. J Endod 2008; 34: 1182-1186.